Glitter, sparkle, and shimmer are always on my must-have list. And this season the selection has never been so tempting says editor Trudi Brewer. It’s no secret I am shimmer obsessed. Here’s my latest collection of must-have sparkle to covet this month. This twinkling powder is made from multidimensional, crystalline pearl dust - and it is glorious. Spun to create a spongy texture it can be applied with the fingers to the cheekbones or above the Cupid’s bow, the eyelids, and mixed with body cream to give an-all-over shimmer - in fact, you can apply it anywhere you want the light to hit your skin. There are four shades pictured here Cosmic. 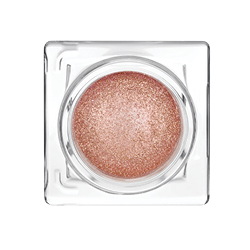 STILA Magnificent Metals Glitter & Glow Liquid Eye Shadow, $38. This shadow is for anyone who wants a hint of sparkle that twinkles when you bat your lashes. A liquid glitter formulation there is no fallout when you swipe the sponge applicator over the lids, and the pretty pigmented shades come is soft neutral colours or vibrant full on hues, but each leaves weightless sparkle. There are 17 colours pictured here Wanderlust. TOO FACED Melted Matte-allic Liquid Lipstick, $33. A new way to light up lips is with this brushed metal liquid sparkle lipstick. The range of colour goes from full-on to subtle pink that works as a glittery top coat. It's long-wearing, with a velvety matte finish that lasts for hours. There are 14 shades pictured here Sugar Kisses. Give in to the glitter craze, honestly once to add a touch of this easy-to-apply twinkling, multi-dimensional shadow the 3D, reflective your lids will be sporting is addictive. This shadow lasts all day, here are nine shades pictured here Beam Time. Nars never fail to impress with new season colour. And this new range of finely milled glitter shadows is dazzling. The dazzling pearl formulation is perfect once applied over a creamy pencil liner to add that disco ball effect to your lids. There are 18 shades pictured here Stud. Tangle Teezer Gold Glaze Compact Styler, $30. My ultimate hair tool has been touched by sparkle. In time for the festive season, this cute gold design is glam but still hard-working. Perfect for detangling knots it leaves a glossy shine on any length hair. HOURGLASS Glitter Eyeshadow Foil, $46. Every girl needs a little pot of glitter and from a brand that knows how to light up the skin. Scatter these light-reflecting pearls across your lids for a touch of pretty sparkle. You can get a barely-there touch of shimmer or layer on a couple of shades and your get a prismatic glitter finish. There are five shades pictured here Foil.